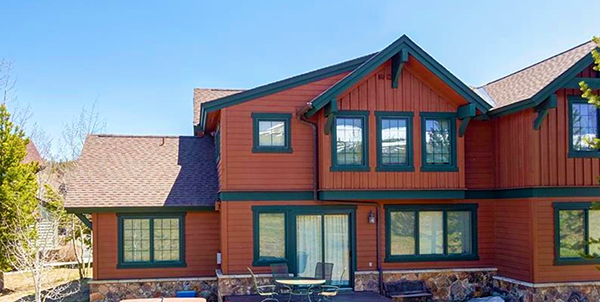 Close to the Swan River, the Colorado Trail, the Breckenridge Golf Course and Highway 9, Highland Greens townhomes and condos for sale are situated in a convenient spot. A spot that served as the community ballfield in the 1970s, and was only recently developed into a collection of 102 townhouses that are the perfect size - not too big, nor too small - and a 50-unit lodge. Consider a Highland Greens townhomes for sale, if you'd rather spend your time recreating, than taking care of property. These townhomes are newer, designed for efficiency and the homeowners association maintains the common grounds and plows all the snow. The Lodge runs a free shuttle to the ski lifts in the winter. Find out more about the local real estate, or browse the Highland Greens townhouse listings found below. Built from 2000 to 2006, Highland Greens real estate is composed of townhomes and condos, both of which are energy efficient, constructed with green materials, and clustered to maximize the open common land. All were designed to include vaulted ceilings, gas fireplaces, patios or decks, one or two-car garages and views of the Tenmile Range. Across Tiger Road from Highland Greens is the 27-hole Breckenridge Public Golf Course, which doubles, in the winter, as the Gold Run Nordic Ski Center. Just north of these townhomes is the Colorado Trail that can lead hikers west over Gold Hill to Copper Mountain, or east toward Kenosha Pass and beyond. In fact, this trail continues for nearly 500 miles, and stretches from Denver to Durango. Near the Colorado Trail is the Swan River, an historically important river that attracted a lot of 1880s gold and silver miners. East, in this drainage, are several ghost towns, old mining structures and many subsidiary trails. And near Highland Greens the Swan runs into the Blue River. A paved bike/pedestrian path runs from Breckenridge along the Blue and connects with paths to Keystone, Frisco, Copper Mountain and Vail. Designated bike lanes are also marked on Tiger Road. So, Highland Greens is close to rivers, golf and trails, but its location - north of the center of Breckenridge - is also north of skier traffic that can be heavy on peak ski days. Conveniently, Highland Greens Townhomes are only five miles from Frisco and I-70, the primary thoroughfare across Colorado. Walk to hiking, biking, Nordic ski trails, fishing, and the Golf Course, and if you don't want to make the short drive back into town, Highland Greens is close to Highway 9, and a stop for the Summit Stage. Ride this free, countywide shuttle downtown, or to the other Summit County ski resorts. The homeowners association allows short-term rentals and some Highland Greens Townhomes for sale attest to good rental income. 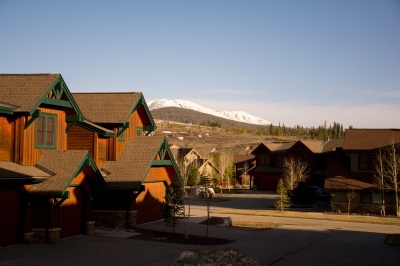 Highland Greens Townhomes are located on the north side of Breckenridge off Tiger Road. Near Highway 9, they are just north and slightly east of the golf course. Drive north from downtown Breckenridge, through the traffic circle and continue on Highway 9 north three miles to Tiger Road. Head east on Tiger for one-tenth of a mile then turn left on Highfield Trail. Highland Greens homes are on Chestnut, Linden and Oak lanes. Ready to discuss the real estate opportunities at Highland Greens or any other Breckenridge area? Contact us to get the conversation started!